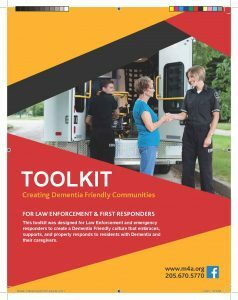 A new booklet for law enforcement and first responders to create a dementia-friendly culture that embraces, supports, and properly responds to residents with dementia and their caregivers. You can download this free resource by clicking on the graphics below. M4A has also developed a 2 hour training program which is available at no cost. 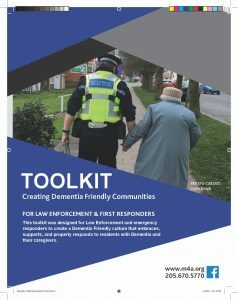 Upon completion of the training, local law enforcement and first responder agencies can be designated as a “dementia friendly department”. Contact Robyn James at rjames@m4a.org to schedule a group training event or to get more information on our Dementia Friendly project. 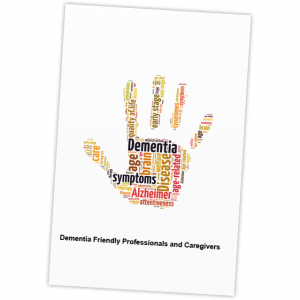 The 20-page booklet is an invaluable resource for anyone wanting to become Dementia Knowledgeable; Dementia Sensitive; and Dementia Responsive.